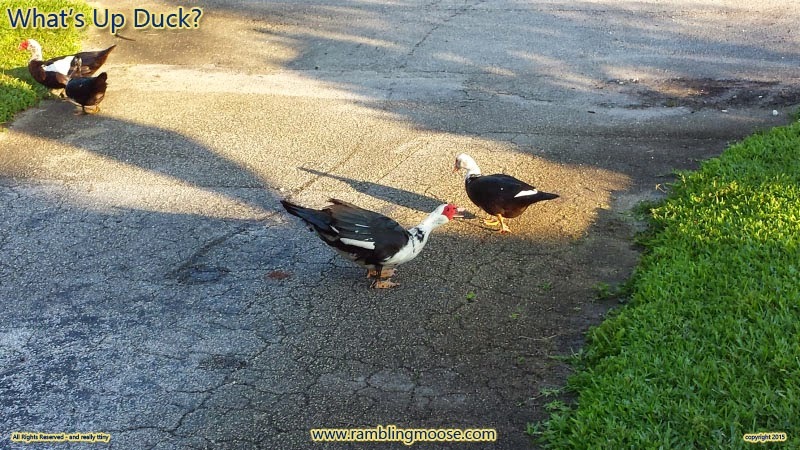 Rambling Moose: What's Up Duck? When you have a herding dog, you should be able to move these things along. My Dog Won't Herd, so I'm out of luck there. We've done walks and there were flocks of these Muscovy Ducks all over the place. Rack walks toward them, they hiss, and walk away. Rack would be more interested in sniffing whatever the last dog left behind than the ducks. Actually, that's not entirely true. Rack met the ducks shortly after we got him. He walked over to a duck, sniffed it, decided it wasn't for him, and went back to his own business. It's a test for herding ability with dogs when they're puppies. Set them out with a flock of ducks, appropriately sized, and see what happens. If the dog eats the duck or the duck eats the dog, you're not going to have a good time. If the dog herds the ducks into a nice tidy circle, send him to a farm. If they ignore each other, then you don't have a herding dog, despite the blood lines. Mine is of the latter. This particular morning I had nothing to do with herding, training dogs, or the like. I needed to take the Jeep out for a spin around town and perhaps to actually go somewhere instead of making a big loop staring at palm trees. Standing on my front porch, I was confronted by a flock. 10 or so of these mostly black and white birds were watching me. I watched back. Content to let them feed, I merely took a picture then walked out to them. That's all that is necessary, they may act annoyed and hiss, but they'll move along. You don't need to do anything more. I got them to move over to the neighbor's yard where there were some more tasty grass simply by walking to the mailbox. They're so laid back that it is possible to pick one up, but what do you do with a bird that doesn't want to be held anyway, so get the thought out of your head, kid! Lettie on the other hand, she had a proper eye for that sort of thing, but she was a little quick when it came to the ducks. She'd run after them, the ducks would fly off, and that would be the end of it. No more entertainment. Lettie's gone, Rack's not good at it, so I managed quite well by myself. The Jeep and I went on our errands and the ducks are still in the neighborhood. So remember that when you do go for a ride, look for ducks in your driveway. Otherwise, the pressed duck you get could be a bit messy.